Eventually, both would be in the Ring of Fame. 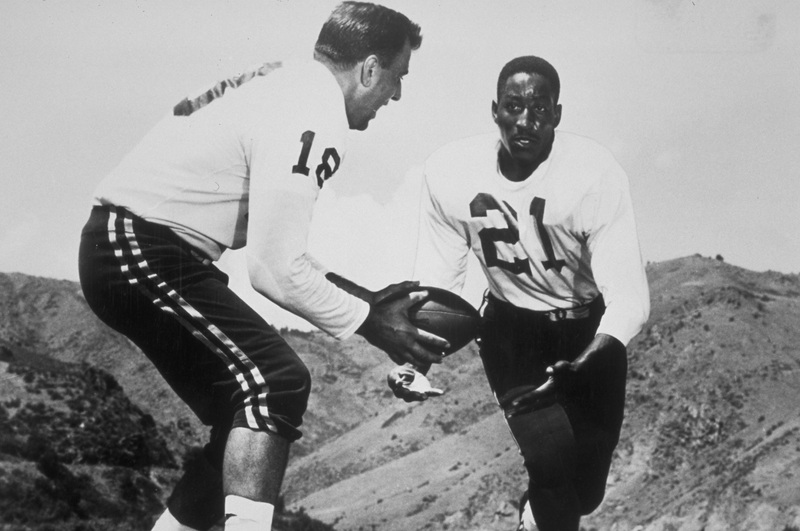 But in 1960, Frank Tripucka and Gene Mingo were backfield mates for the fledgling Broncos. After losing all five preseason games, the Broncos become the first AFL victor when they defeat the Patriots in the first-ever AFL game, a 13-10 win at Nickerson Field in Boston. The game on Friday night, September 9, 1960, was not televised. Prime-time football was a notion barely conceived, especially for a league that had barely begun to crawl. And the lights at Nickerson Field weren’t bright enough for a viable nighttime broadcast, anyway. But the Broncos lit up the night with big plays: quarterback Frank Tripucka’s 59-yard pass to Al Carmichael for the first touchdown in AFL history, and then kicker/runner/receiver/returner Gene Mingo’s 76-yard jaunt through the Patriots’ punt-coverage team for the touchdown that eventually provided the winning points in a 13-10 triumph. The only problem? The multi-talented Mingo was needed for the point-after-touchdown. Mingo missed the kick, but his lively legs on the punt return were more than enough to get the Broncos off to a promising start.